Roasted tomato soup is something I make a lot in the cooler months, but I have tons of tomatoes coming out of the garden, and there’s only so much sauce and so many sandwiches I can take. 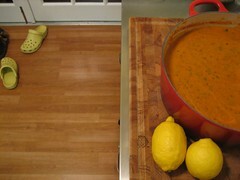 So soup it is. I also always use plum tomatoes in this recipe, but this time I used not-plums (and some were even still a little green). I quarter the quasi-ruby beauties and spread them on a sheet pan. I pour over 1/4 cup olive oil (plus 2 tblsps. ), 2 tblsps. Kosher salt and a nice cracking of pepper. 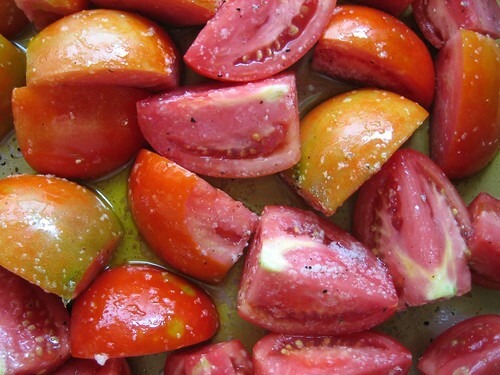 Toss the toms to get them well-coated and slide them into a 400 degree oven (place the rack in the upper part of the oven for good charring) for 45 minutes. Near the end of the roasting time, saute 2 chopped onions and 6 cloves of garlic in 2 tblsps. of unsalted butter, an equal amount of olive oil and a nice sprinkling of red pepper flakes. When the onions are where you want them, add a 28oz can to crushed tomatoes, 1 quart low sodium chicken stock (not broth), 1 tsp. 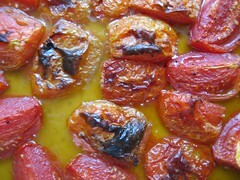 fresh thyme, 4 cups of fresh, whole basil leaves and the roasted toms with their juices. Bring it to a boil, reduce heat and simmer for 40 minutes. Serve it chunky, or blitz it with a hand-held food mill. The next day it’s always better. This will be lunch for the week. Make it a meal by serving it with Aged English Cheddar sandwiches on really good bread.